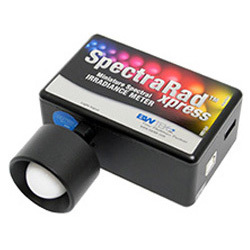 The SpectraRad Xpress is a miniature spectral irradiance meter designed for field, industrial, and lab applications with a plug-and-play USB 2.0 interface. A transmissive cosine corrector is coupled to a spectrometer which then is irradiance calibrated against a NIST traceable Tungsten light source. Optimized software is provided for characterization and measurement of many application lighting devices and systems. Standard software features include timeline recording, data smoothing, illuminance (lux), chromaticity, color temperature, external triggered pulsed light capturing, and other data handling functions. The SpectraRad Xpress is ideal for lamp and LED characterization (requires input optic option), color analysis, solar studies, photostability testing, photobiology and photochemistry. Although filter based instruments are desired for certain properties such as cost, speed and portability, they are not always the best choice for analytical measurements. Filter based instruments only acquire three data points across the entire spectrum of light to yield colorimetric values. This is accomplished by the use of filters corresponding to the normal human eye response. These filters can only be manufactured to a certain degree of accuracy. Due to these facts, filter based meters are susceptible to errors because of the deviation of the filter response from the ideal human eye response and the lack of resolution needed to accurately describe narrow bandwidth light sources. The SpectraRad Xpress avoids these problems at a comparable cost, higher speed, and small footprint because it acquires hundreds of data points across the visible spectrum. In addition, the 2048 pixel linear CCD array provides the precision required to accurately measure narrow bandwidth light sources or LEDs. Having multiple sensors also enables the unit to report spectral data and display spectral graphs, making it the ideal instrument for evaluating LEDs, which are today’s dominant light source.